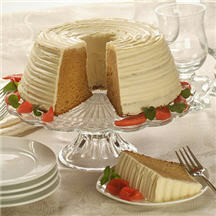 The brown sugar in this cake gives it a beautiful color and delectable flavor. Covered with creamy frosting and decorated with red guava shells, this festive Christmas cake is ideal for any holiday gathering. Canned guava shells may vary in color, so don't be concerned if some are less brightly colored. For a simple -- but still delicious -- presentation, omit the frosting and guava shells and dust the top of the cake with powdered sugar just before serving. For Cake: Preheat oven to 350°F (175°C). Grease 9-inch (10-cup) tube pan and flour with 3 tablespoons flour. For Carnation Frostig: Beat butter and powdered sugar in large mixer bowl until creamy. Add 1/4 cup evaporated milk and vanilla extract; mix until smooth. Makes 2 cups. Tip: A 10-cup Bundt pan can also be used. Follow recipe above and bake for 50 to 55 minutes.